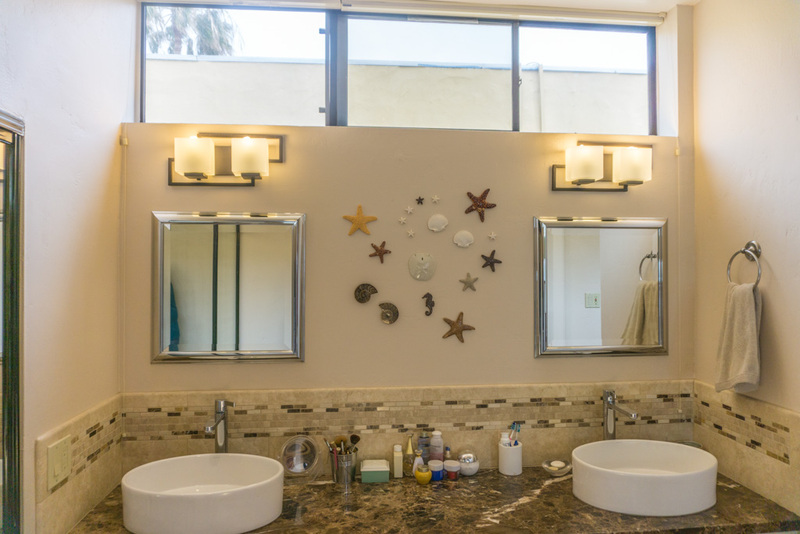 This remodeling project was done just a block away from the beach in La Jolla. The three-story condo was originally built sometime between the mid 1980s – mid 1990s. It was a typical “builder’s project” in that everything in the original construction was as cheap as could be. 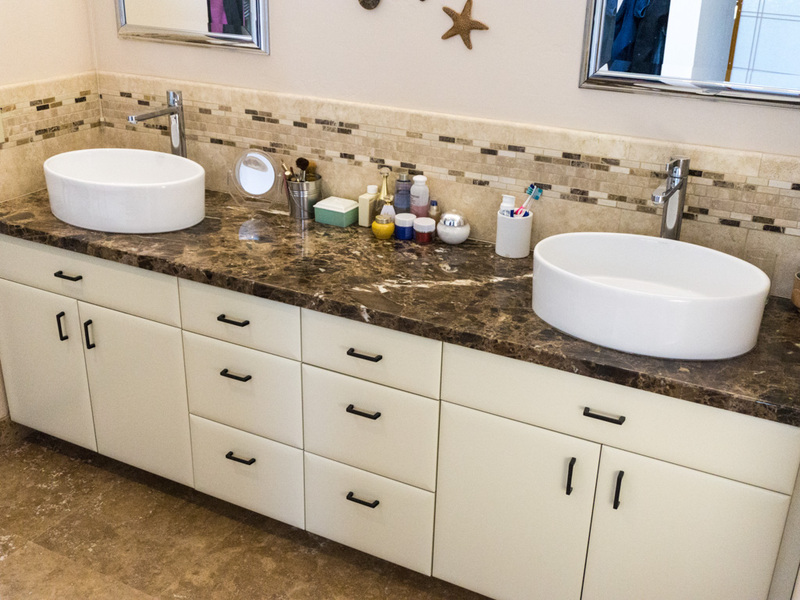 The client had a limited budget and simply wanted to make the baths be more open, have better storage options, and look a little more stylish. We used all of the existing windows and openings which didn’t require any structural alterations. 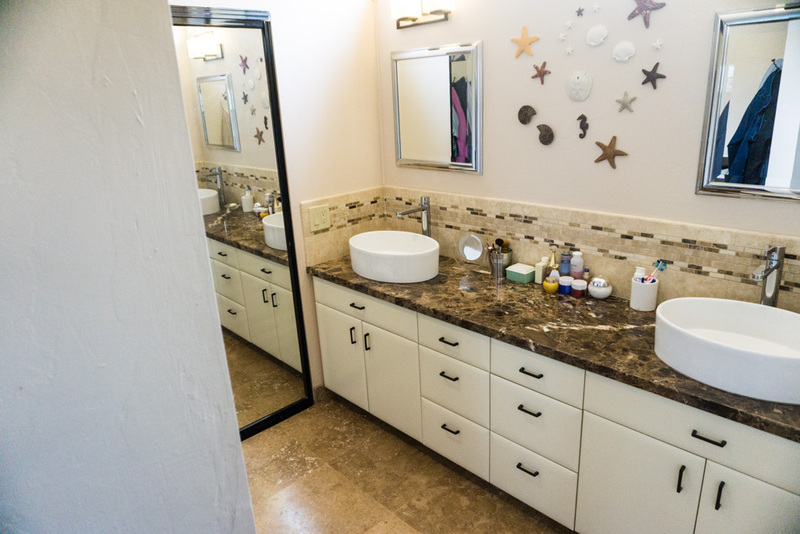 We upgraded the lighting in all the rooms to LED lights and installed cabinets with a thermofoil surface finish, which provide a low-maintenance long-life product for bathrooms, and implemented a few unique solutions for this remodel. 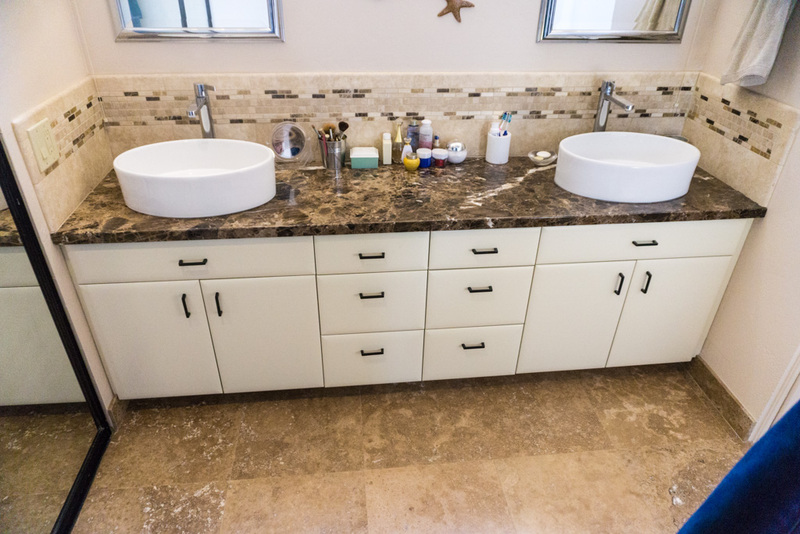 There were two bathrooms involved in this project, a combination guest bath/powder room that was on the first floor and the master bathroom on the top floor. In the guest bathroom, we kept the original tub and tub surround (which you can see kind of a little corner of it peeking out in some of the photos). 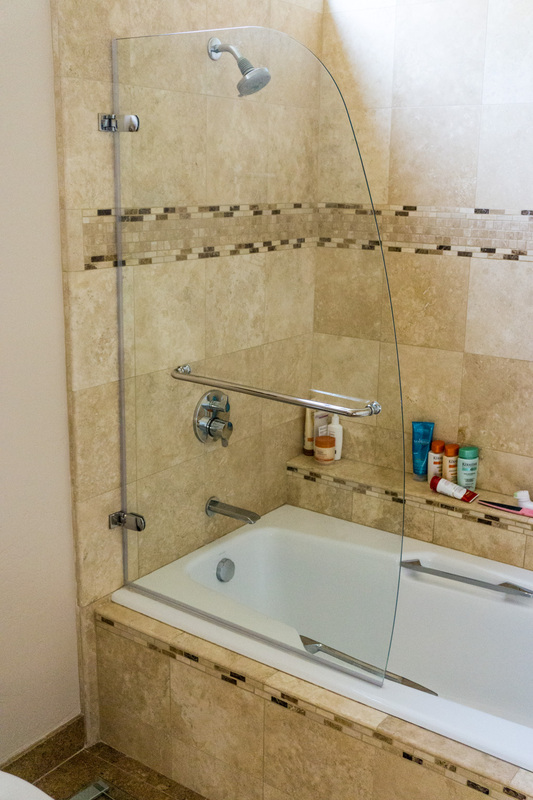 The shower had a sliding door in place that the homeowner hated because it was always dirty and didn’t give much access to use the tub. So we simply removed the sliding glass doors and the homeowner opted to just put up a shower curtain. 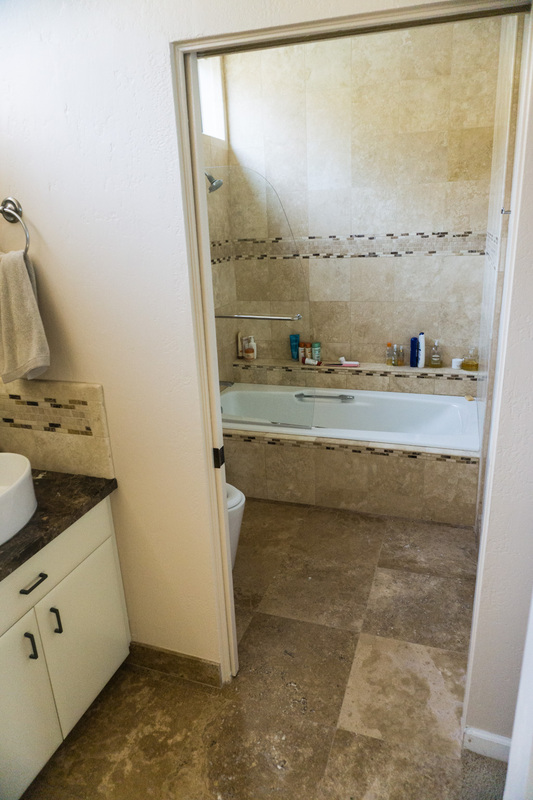 We cleaned up the tile grout for her and placed new grout in the holes left behind by the old shower doors, which was fine for her because she did not wish to extend her budget and put a lot of money into an extensive remodel for this bathroom, merely make it a more presentable. 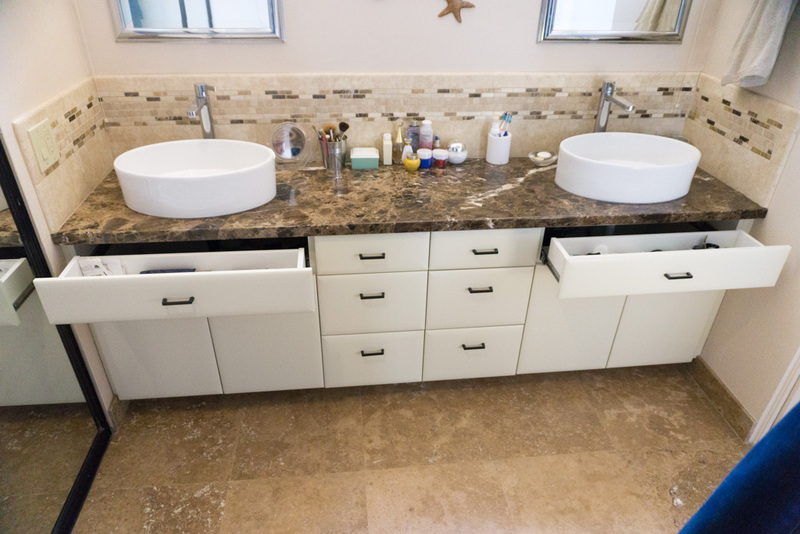 The only thing other major change in here was the installation of a new vanity because she did want to improve the bath’s storage options. 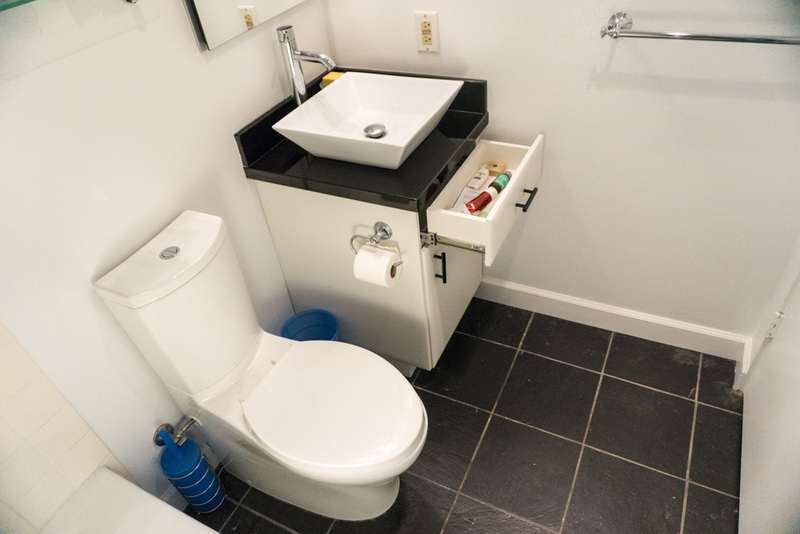 We were able to put a little drawer underneath the vessel sink. 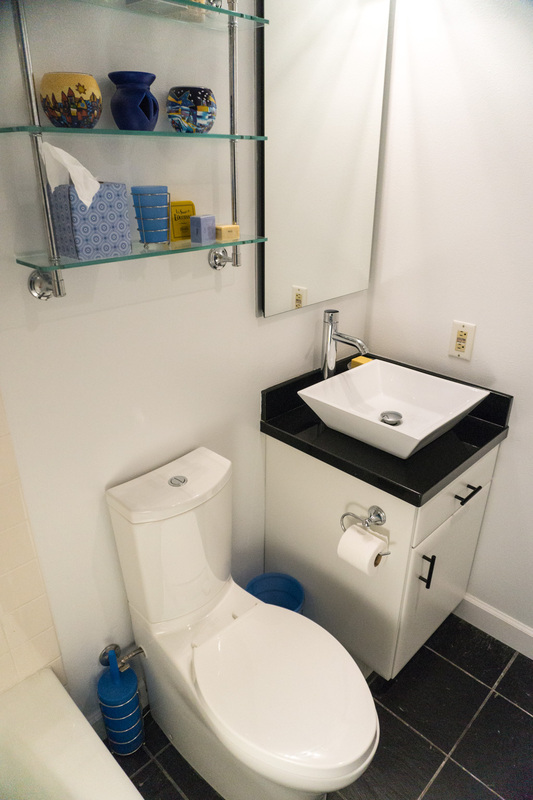 The drawer itself is a little shallow as it has to stop when it hits the piping for the sink, but it does allow for a little bit of additional storage, and we supplemented the storage by putting in the glass shelves over the toilet and a spacious medicine cabinet above the sink. 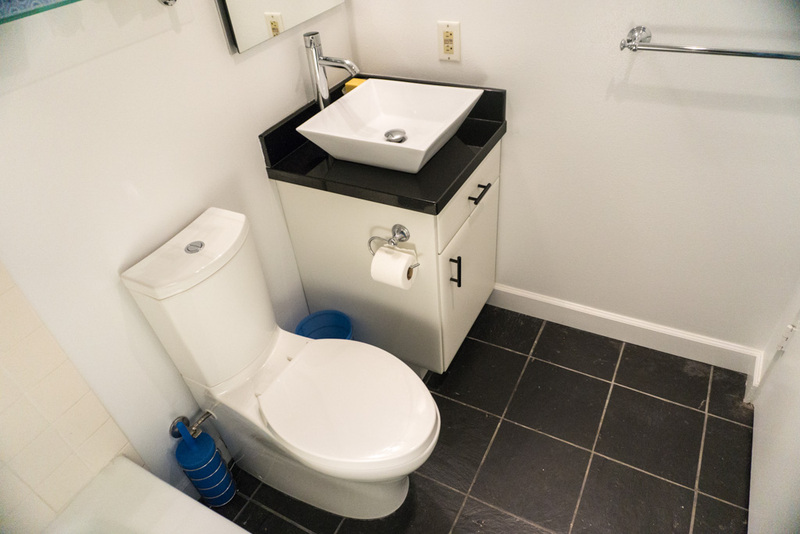 The countertop is 36” tall and with the vessel sink sitting atop it, we have a really convenient high sink so that people won’t have to bend down as they’re washing their face or hands to keep water from missing the sink. 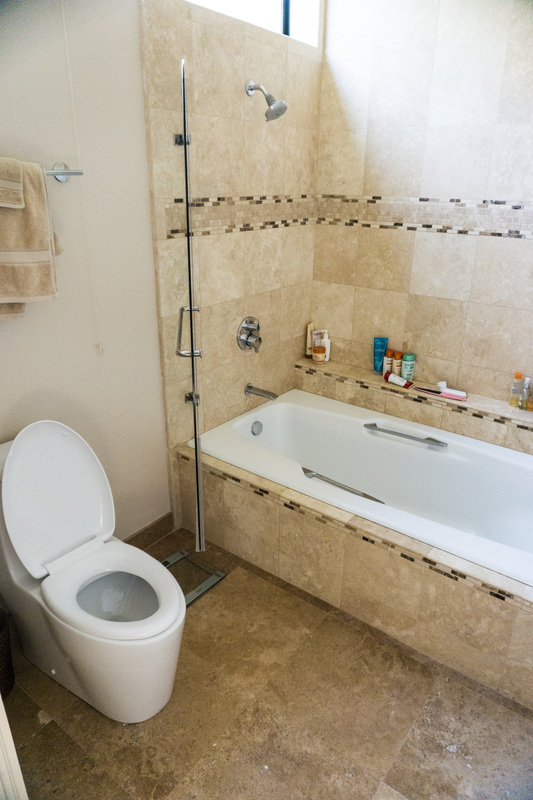 The flooring in this bathroom is not new, it is existing slate flooring that she kept. As mentioned above, we did put in new LED lighting with great luminosity. The configuration of this bathroom wasn’t really changed at all. As with the other areas in the home we worked on, we put in good LED lighting to upgrade the artificial lighting quality and reduce energy use. 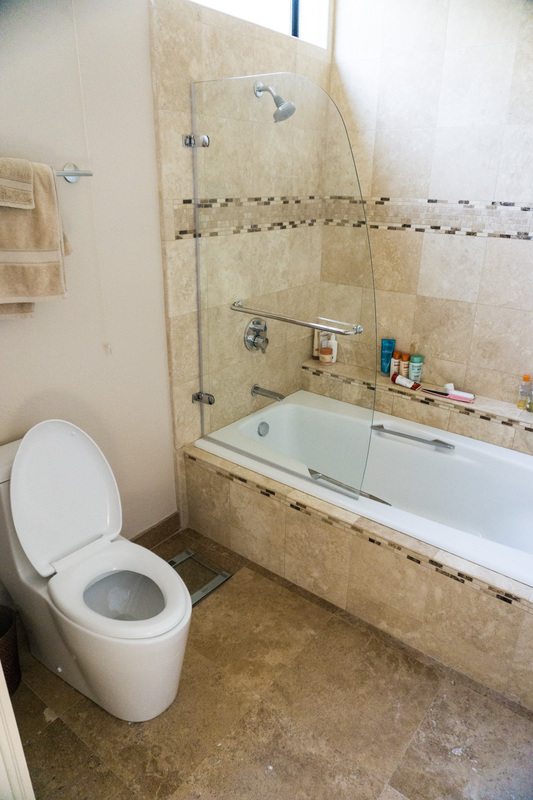 The previous owner of this condo had actually blocked off some of the room’s natural light by covering over the windows over the sinks with drywall, because they did not want to pay to fix the broken windows. After we uncovered them, we replaced the glass & fixed the windows, which resulted in more natural light and ventilation coming into the rooms. 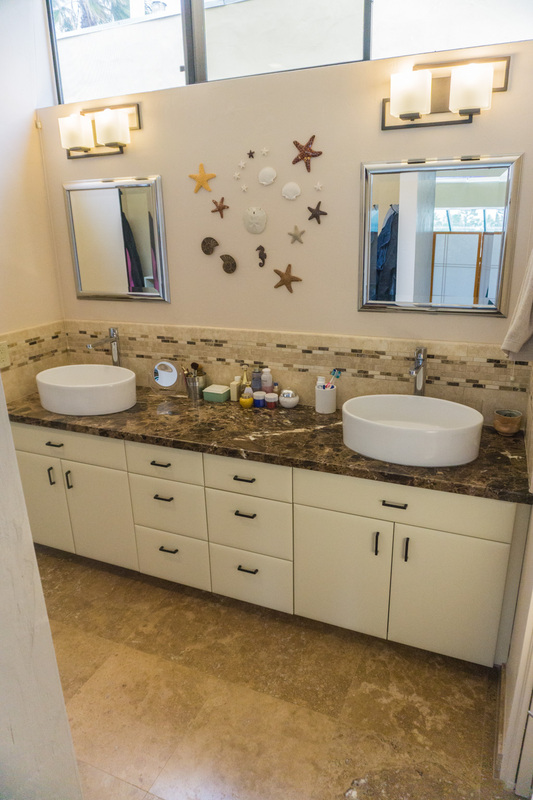 For the closet area you see just off the master bath vanity, the client kept the existing sliding mirrored doors. We installed new cabinets with large drawers, going again with a 36” height and a thermofoil finish for a clean and simple modern look. 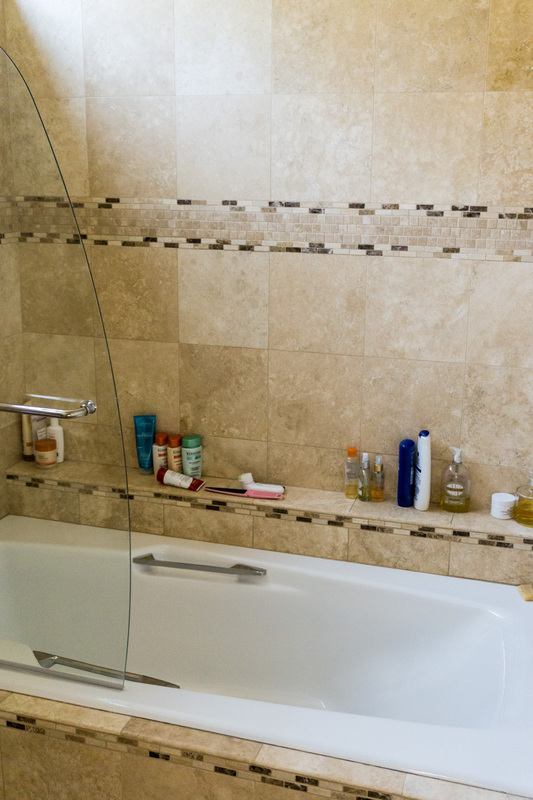 In this bath, we have granite countertops and tile backsplashes. 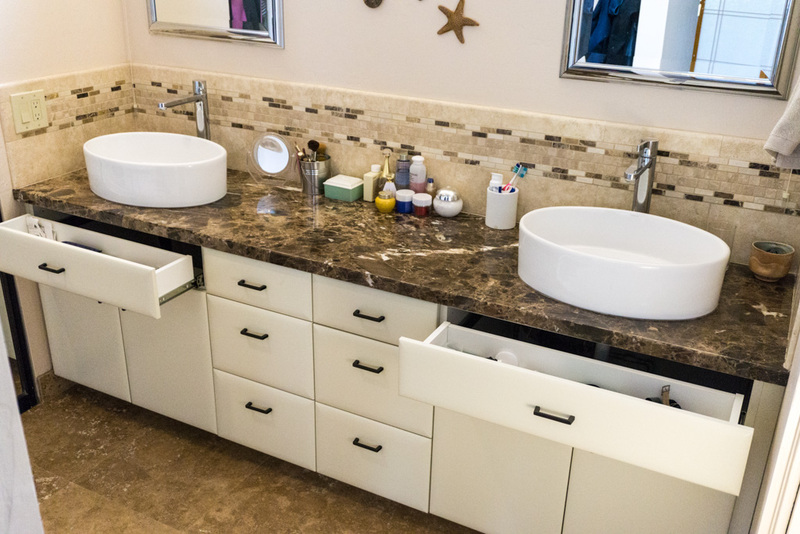 For the vanity, we used vessel sinks, once again allowing for shallow working drawers directly below the sink. 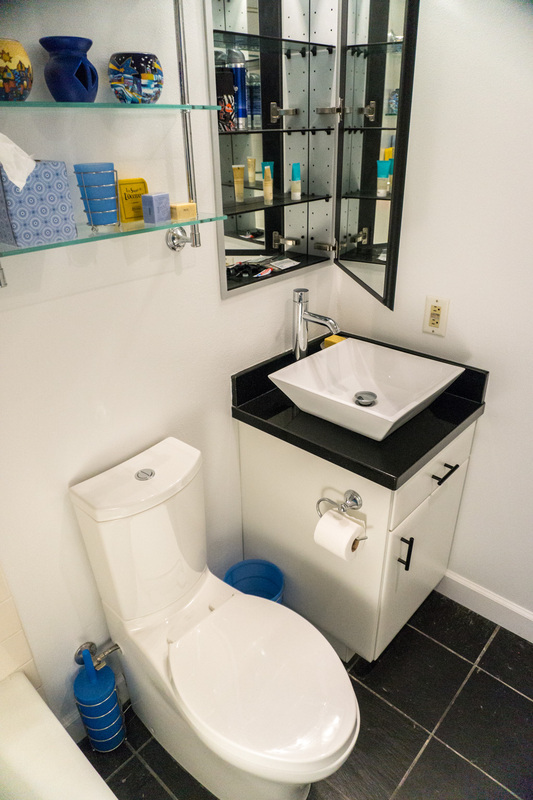 These changes made this bathroom fit the client’s needs a lot better while creating a space that’s far more open, more stylish, well-lit, and easy to maintain. 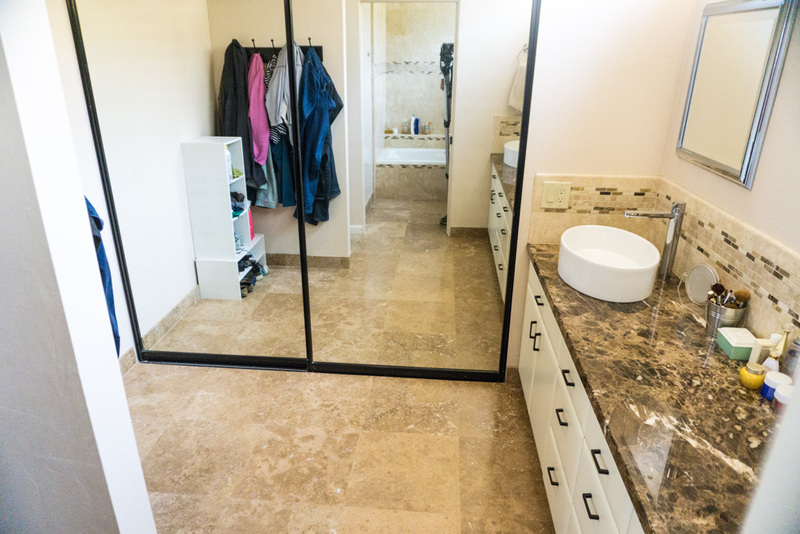 We installed travertine marble tiles in the shower/bath for the wall treatment, and used a darker travertine for the flooring throughout the bathroom. 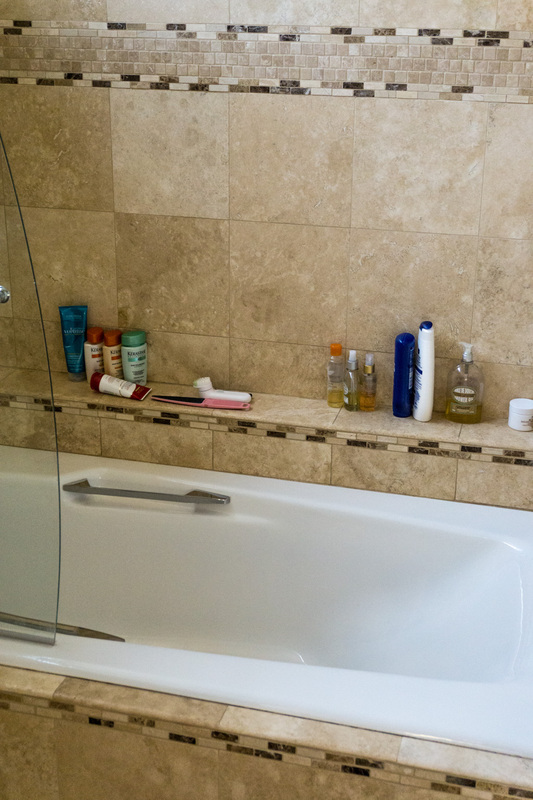 We had the space to put in a larger tub than the original using a 72”x 36” drop-in tub and also added a 6” deep shelf the entire length of the tub wall. 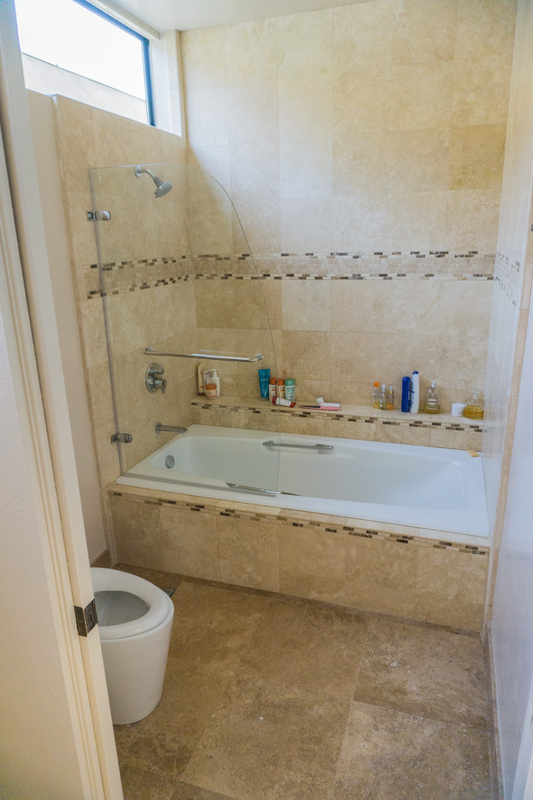 Since this client prefers taking baths to showers, the use of a sliding shower door was never an option. 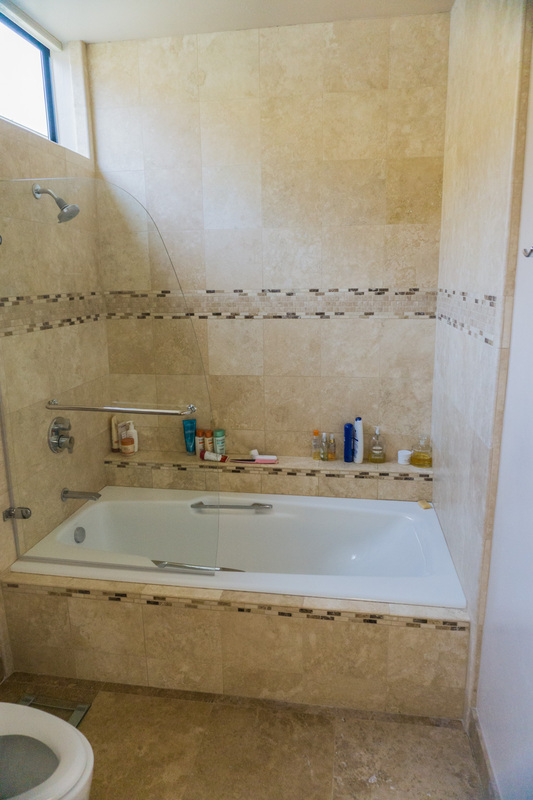 We instead used a simple swinging partition glass that is ample for keeping water in the tub when the shower is used, but swings out of the way easily to make the tub far more accessible and usable as a tub. 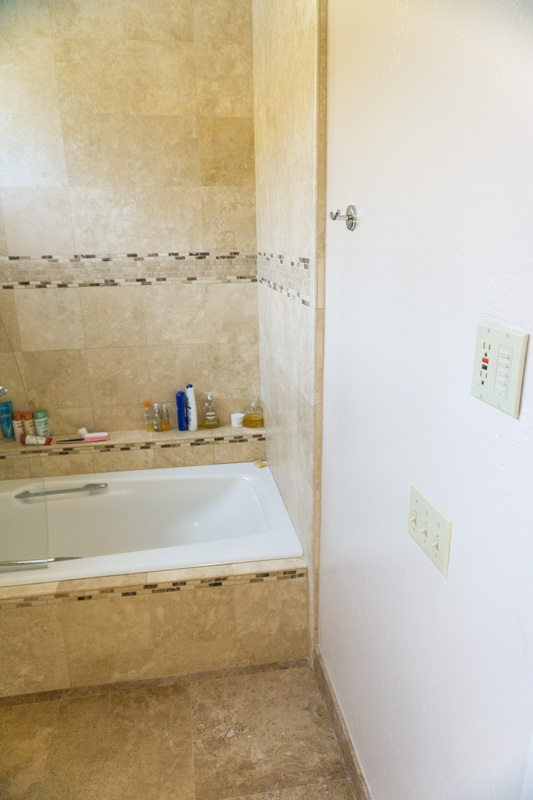 There’s one picture of the bath tub side wall where you see a GFI outlet and a timer switch. Unlike a lot of my bathrooms, that timer switch is not connected to a vent or heater. This bathroom is completely wide open to her bedroom, it’s just one large area and she never closes that pocket door, so the homeowner decided she didn’t want/need a vent because she’d lived there for a number of years without one and never had any problems with moisture build-up. 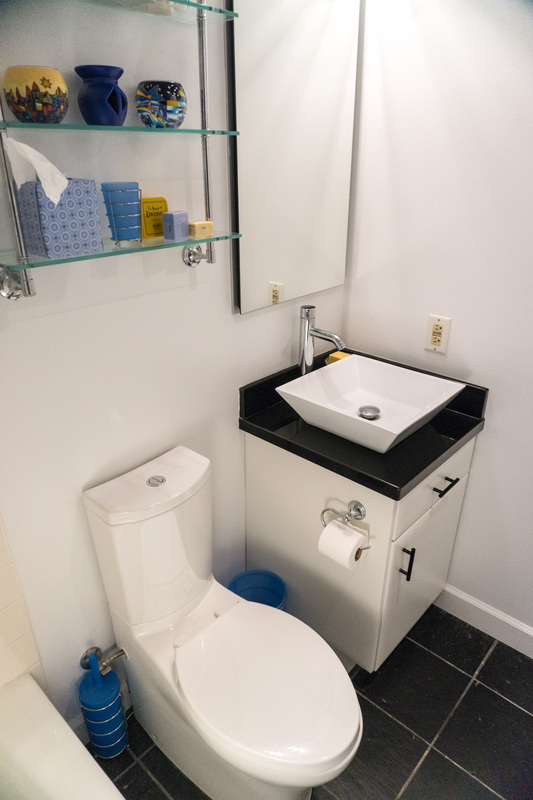 That timer switch is instead connected to a recirculating pump, which is in this bathroom under the right hand sink. This pump takes water out of the hot water line and pushes it back into the cold water line underneath that sink. Basically, the idea is that if she hits that timer switch 15 minutes before she’s going to draw a tub or take a shower, by the time she turns on the water it is hot. The pump turns on when the switch is activated, and automatically turns itself off so it can’t inadvertently be left on. It’s a good solution that doesn’t require automated timers, which I’ve never thought made any sense because active people rarely take showers at exactly the same time every day. I think having recirculating systems with on-demand timer switches is far more effective and far more practical than any other solution for a recirculating system. Technically, you even could hook it up to multiple switches in different rooms.